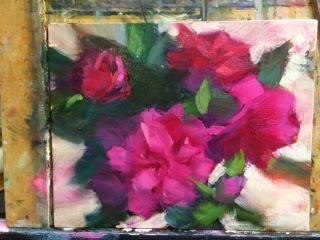 Had a really fun day today, day one of a 3 day workshop I am teaching "Painting Flowers Alla Prima in Oils". 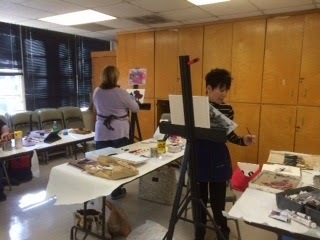 Started out with the basics today to have students learn the approach I use for flower paintings. Here are a few steps along the way from the initial transparent color block in of shapes and background, to establishing more of the elements/forms and finally adding a few finishing touches at the end trying to retain the freshness, essence and spirit of the flowers and not be too concerned with getting every exact detail. Broke down the stages and then students followed along. 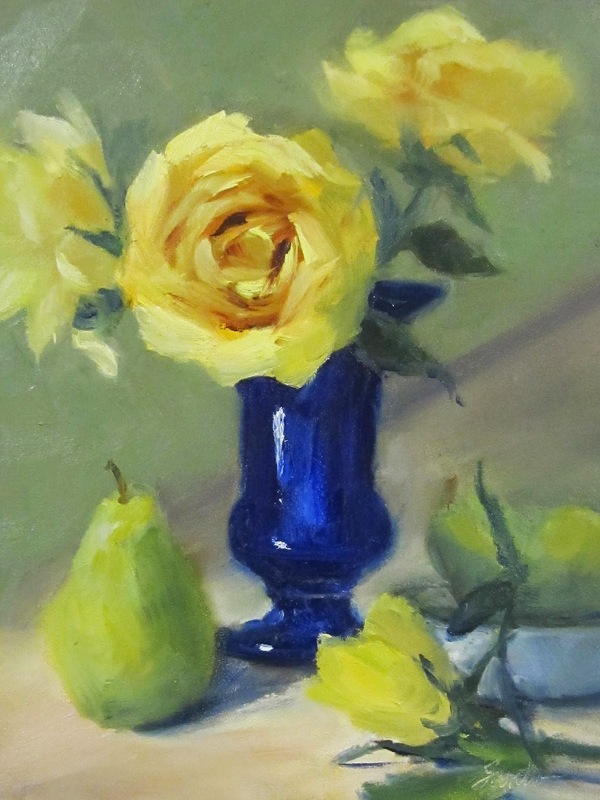 Tomorrow we'll add a little more complexity by doing individual still life set ups of flowers in ceramic containers and practice the process again. This may look familiar. 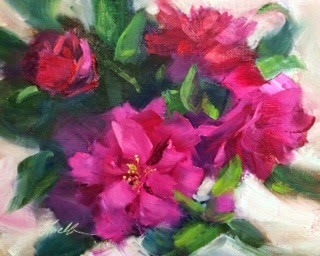 I did a similar painting last year when I had fresh peonies to work from. I had wanted to enter it in a show, but forgot to set it aside and sent it to one of my galleries where is was sold recently. So this is similar, (no two originals are ever exactly the same) done form a reference photo I shot while I had the fresh peonies last year. I wish I can say the second time around was easier- but that's not necessarily so. Found an old photo of these falls (not even sure where they are- somewhere in GA?) in my files so decided to do a small study of a different landscape for a change. This was a small study begun earlier this month. I had done a simple set up of a pear and a couple of pansies form my garden as a practice piece and was not too pleased with the initial outcome (which is pictured below). I set it aside for several weeks and finally thought what to I have to lose to try and improve it. With nothing to lose and a sense of no attachment, I just went for it and added color, bolder brushwork etc.. on top of what was already there. While I can't say the 2nd version pictured above is one of my all time favorites, I can see that rather than give up or just throw it out, it was worth giving it a 2nd shot to push what I initially deemed a failure to another level. The revised version does seem to me to have more energy and life vs the original which was okay but not very exciting. Continuing on my exploration of pushing things in a bit more abstract direction with an aim of putting more of myself, my emotions, my energy into my paintings. You may recall a couple of weeks ago I had posted some small studies that included trumpet vines. I decided to push that idea further with this somewhat larger piece. I started out with a sketch of the general gesture I wanted this to have and some general photo examples of a close up flower and from there just tried to stay in the feeling zone of how I feel whenever I see trumpet vines. The rest is entirely made up from my imagination/memory. I first remember noticing trumpet vines on one of my early trips to Tuscany in 2001. And ever since they have had a hold on me. I love the surprise of orange color that you see popping out here and there and the energy and dance of the vines. so much so that my husband out up an arbor for me in our garden and it has trumpet vines and jasmine. It's always exciting to see them come into bloom each year. So this is another composition I did based off the same scene as other painting( Hydrangea Garden II) I posted yesterday this is similar to a composition I did in a small study last year. Wanted to explore a couple of different compositional ideas to see which I liked better. Do you have a favorite? Photo's from the original inspiration are also posted on yesterdays blog. Did a new composition of a scene I did a study of late last year. 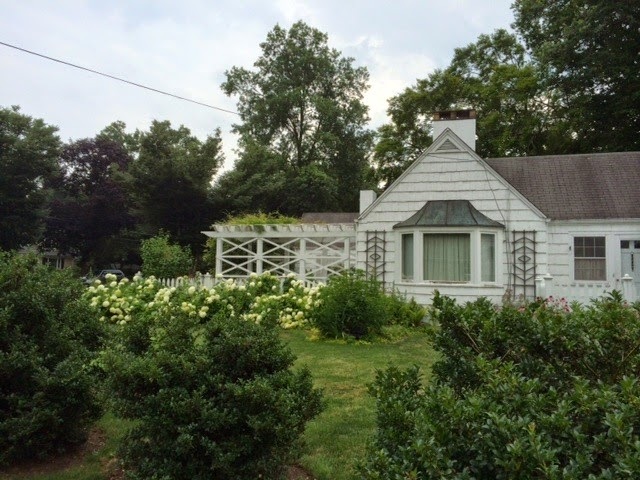 It was one of those "stop the car" moments when I saw a lush garden filled with hydrangeas while driving with my friend up in New Jersey. It was too short notice to literally stop the car, but we did go back later and get some photo's. 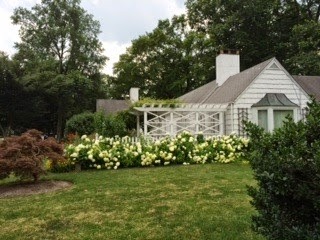 I used some artistic license here to alter the composition but hopefully still hold on to the excitement of seeing those fresh white hydrangeas against all that green foliage. Below were the original photo's I had to work with so you can see I took quite a bit of "artistic license". My husband surprised me with some red roses tonight so they became the inspiration for this painting "Romance". I'm in an experimental mode lately. Exploring being more abstract, looser in areas. Trying some new approaches, new materials, new brushes. 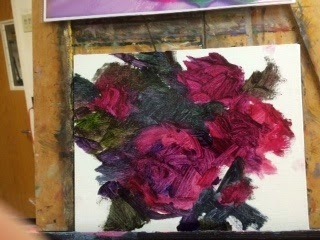 In this one I was trying to see how little I could actually say and still communicate the essence of roses. I do like the feeling of energy and softness which are a 2 aspects of flowers that I am relate to. Haven't been posting much artwork this week, but know that I have been painting pretty much every day. I've been doing some larger pieces and have several in the works that are not quite done yet. Here's one called "Chianti Classic". I've been stressing the value of doing preliminary thumbnail sketches with my students and used this one as an opportunity to share a number of different compositional formats. I was just working of a photo of a building I liked in Tuscany, and my memories and tried to come up with multiple possibilities and then chose the design I liked best to scale up to a full painting. (radiating lines) to use as a plan for the painting. These are simple ideas, that literally take a few minutes each, done with a black and grey markers in my sketchbook to get an idea of how I might arrange the shapes and masses on my canvas. Details are not important here. The big shapes, division of space is the idea and how you want the eye to flow in and through the composition is the point. A few minutes planning up front is well worth saving aggravation and frustration later when you might feel lost in the middle of a painting not knowing where you are going. Thanks to one of my Facebook friends for suggesting I paint one of my travel photo's I had posted earlier this week. I would probably have gotten to it eventually, but her encouragement got my curiosity going so I decided to give it a try tonight and it was a lot of fun. 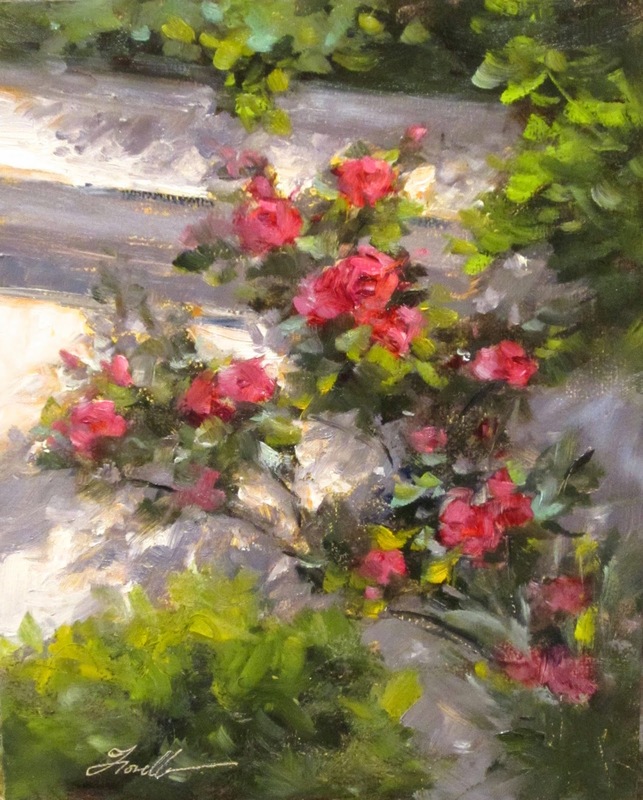 This scene is full of my favorite things to paint, soft, colorful, sunlit flowers contrasted against the rough texture of a wall with shadows, dappled light. This subject matter is irresistible to me. It really warms my heart. Today's painting was an experiment and WAY out of my comfort zone- but also fun and freeing. Just played with shapes, colors, thick paint and edges to see how little specific information I could communicate while still capturing the spirit or essence of something. Played with extremes of soft edges on left to extremely hard edges and thick paint on right to se the impact on how that would attract the eye. Not sure where I will go with this, but it's fun to play and learn by doing without any attachment to the outcome. Todays' painting was a joy to paint. ( Yes, not every painting day is perfect, some days are more fun than others and some can be frustrating at times). I've been working on getting a little more abstract with my florals while still retaining a sense of realism at the center of interest. This was an experiment with that idea. I did several thumbnail sketches of an overall design and flow and had an example of what one trumpet flower looked like for reference, but really had no other references. At first I thought I came up with this from my head, since I was imagining it- it's made up, no real place, photo or still life set up that this was inspired by. But it's probably more accurate to say it came from my heart. When asked by someone the other day what I loved about flowers I replied , of course the colors and softness, but also the sense of flow. ( Did you ever notice the worked FLOWER contains FLOW?). 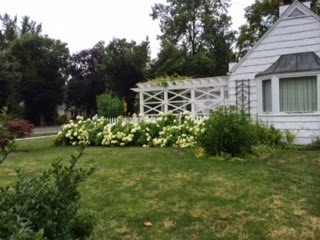 I love the movement of plants and vines and these trumpet vines hold a special place in my heart. I have memories of connecting with them for the first time on a trip to Tuscany in 2001, when I stayed at a villa that had lots of them all over canopies. I became enchanted with the little bursts of orange color and the dance of the vines. 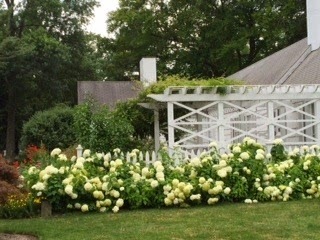 So much so that we added an arbor to our garden here in Atlanta and have trumpet vines covering part of it. There's not much to see this time of year, but in the summer when the orange buds start to pop it is a happy sight. 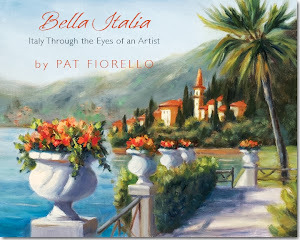 Preparing for a larger painting of Tuscany to do later this week. Started with some small thumbnail sketches for differnt compositional ideas then did a quick small oil study. Will share the final larger version once complete so stay tuned. 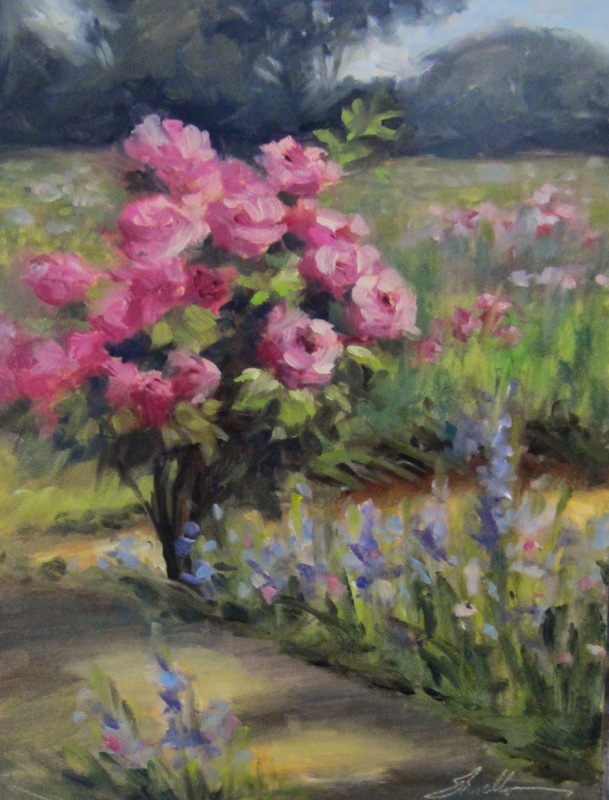 Did a small study of roses in a garden setting today. Working on getting a little looser, more abstract, except for the center of interest). Another photo reference from my "I have to paint this someday folder". 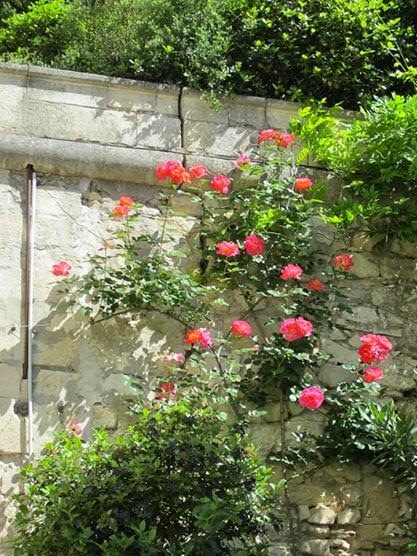 I did paint on location here a couple of years ago, but that day just did a rose close-up. I had a photo of some of the surrounding area so put the whole bush in a landscape scene this time. Below is another photo of the painting I posted yesterday. Hopefully the subtle colors read a bit better since I was able to photograph it in natural light. the flowers actually have a warm glow which doesn't quite come thru in the photo's. Experimenting with some new approaches in the new year. 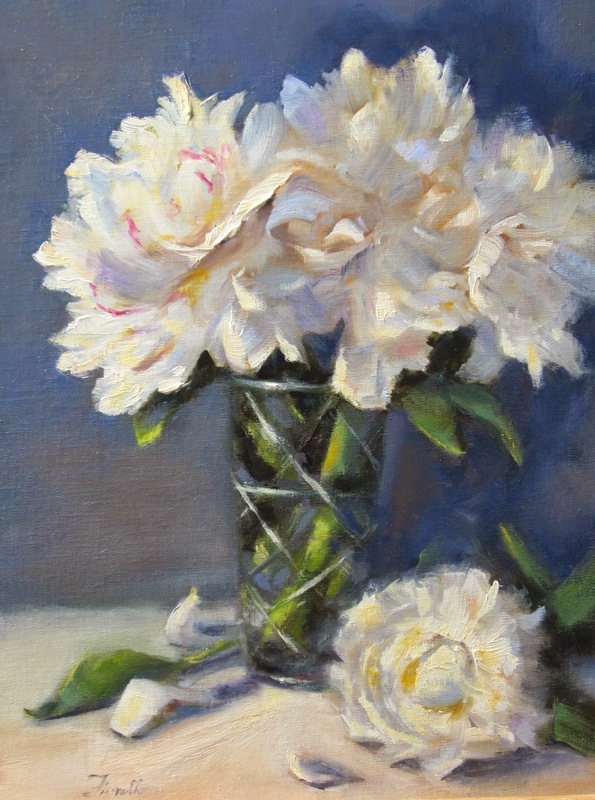 I had done some Peonies last summer and my good friend, artist Carolyn Majewski asked me if I thought about cropping in on them and making them really big. I bought a large long format canvas but never got around to doing it but had it in the back of my mind( on the "someday" list). 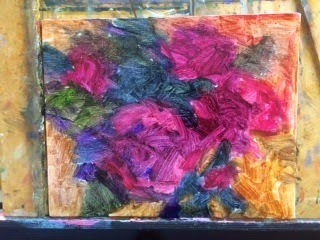 Today I did a "test drive" on a smaller 8 x 16 canvas to see how it would feel to do it a bit more abstractly. I have to say it was fun and freeing ( and a little scary at times) so thanks Carolyn for the suggestion to go out of my comfort zone. It's dark out now so couldn't get a photo in daylight, so I apologize if this photo isn't the greatest. If I can get a better image tomorrow, I'll repost it. First painting of the new year! Looking forward to even more time for painting this year, experimenting in some new directions and learning more. 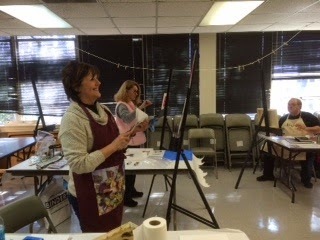 Have some fun painting workshops to look forward to in the US, France and Italy.